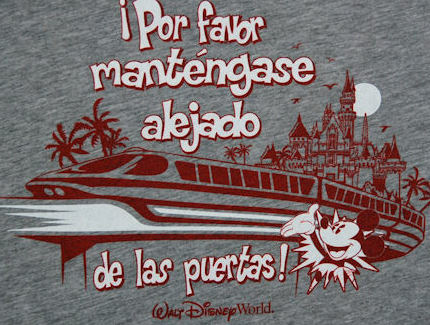 “Please Stand Clear of the Doors” isn’t just a cute phrase you can put on a t-shirt anymore. It can also be life-saving. On a recent trip to Walt Disney World, one of the monorail doors opened on monorail red while making the Ticket and Transportation Center to Epcot loop. Two videos were posted to Instagram by @abbieprimeknits, check out the first one below. I recently spoke with Abbie about her experience on the monorail via e-mail. We boarded Monorail Red at the TTC to go to Epcot. Since it was the day of the half marathon, we felt that was the best method of reaching Epcot. We were the last to board our car. The doors were closed but the door you see open in the video would not latch and kept returning to the open position. The platform attendant tried several times to get it to stay closed but was unable to do so. Maintenance was apparently on the platform for a previous issue and was called over. The maintenance person spent around 10 minutes working on the door and mechanisms and was able to get the door to latch, but there was no testing or anything done. We were told before they closed the remaining (operating) door not to lean on the doors. We then proceeded out of TTC. As we were traveling over the curve outside of TTC the door popped open. Presumably, the flex of the curve released whatever maintenance did to latch the door. The train did not stop and there were no audible or visible alarms. The passengers in the car were all adults with the exception of two young children riding on parents’ laps. Those parents were seated. All of the passengers standing were adults and were able to move into the center of the car away from the door. None of us were aware of an emergency phone. (I’m a New York City resident and I ride the subways daily; we don’t have emergency phones. It didn’t even occur to me to look for one.) My purse was on my lap and my phone was in it so I was able to take my phone out without moving or turning in my seat. I did not want to try to get up or move from my seat in any way that might upset my balance. Several of the people in the car took charge, reminding everyone that we were unharmed and that if nobody moved and we were calm we would reach the station safely. That went a long way towards keeping everyone calm. I was personally feeling very panicked but I was also aware that staying in my seat was the safest way to remain. The laughter was, I think, a panic response. Everyone was very wide-eyed and holding very tightly to rails and seats. The woman next to me, holding her baby, kept saying she was relieved she had her phone so the baby could watch a video and stay distracted and not fuss. The platform attendant at Epcot realized the door was open as we pulled in to the station and immediately reached for his radio and went to inform the driver. We spoke with them briefly as we exited the train. They scolded us for not using the emergency phone (as stated above, we weren’t aware it was there). If they asked if people were OK or to confirm that everyone was present I did not hear it. I told them I had filmed video of it and offered to show them, on the assumption it might better help them understand the situation. I was told that wasn’t necessary. The platform crew did not speak to us further, so we left to find a restroom and water. As we left the station I heard an announcement that the train was returning to the yard and not to board it. We saw Monorail Red had returned to service on the MK loop the next day. Obviously, there’s a lot of safety issues here. In hindsight, that train shouldn’t have been allowed to leave the TTC. I trusted the crew when they said the door was fixed, and again in hindsight that was a mistake. I think it would be helpful for Disney to include the emergency phones in their boarding announcements. Whatever failsafes they have that are supposed to stop the train were obviously not working in this situation. That and the fact that maintenance felt comfortable sending the car out in that condition are the two most concerning aspects to me. I am grateful that the riders were all calm and that the car was not crowded, and that there were no children standing on the train. This could have ended very differently. I am hoping that Disney will acknowledge these problems and demonstrate a revision of procedure that will ensure it will not happen again. I love the monorail and in the past have taken every opportunity to ride them, but from now on I will take the bus. Many thanks to Abbie for the interview. The question is, what will change because of this situation? Will Disney take different precautions with doors popping open? Will they make the phones in the cabin more noticeable? More importantly, how does it make you feel? Do you feel safe riding the monorail? Your thoughts? This entry was posted in Disney and tagged Monorail, Monorail door open, Monorail red. Bookmark the permalink. Trackbacks are closed, but you can post a comment.